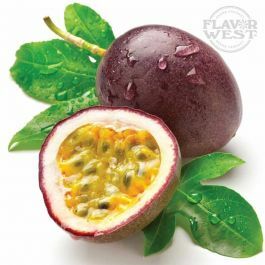 Passion fruit flavor is an aromatic, juicy, and fruity flavoring and has a tropical sweet-tart taste. It perfectly adds exceptional flavor and aroma to your creations. Gives great taste and scent to beverages, drinks, baked treats, pastries, sorbet, ice cream, gelato, yoghurt, and more Type: Passion Fruit Water Soluble Flavoring. Ingredients: Natural and Artificial Flavoring, Propylene Glycol and Ethanol. USP Kosher Grade Flavoring. Usage Rate: 15-20% for E-use. Flavor Suitability: Suitable for beverages and drinks, baked treats, gelato, pastries, yoghurt, ice cream and more. Specific Gravity: 1.02 No Refunds on Flavoring.